Live Red Button coverage women's race 20.30-21.55 and men's race 22.30-23.50. Highlights on BBC2 Monday, 7 September at 13.45. 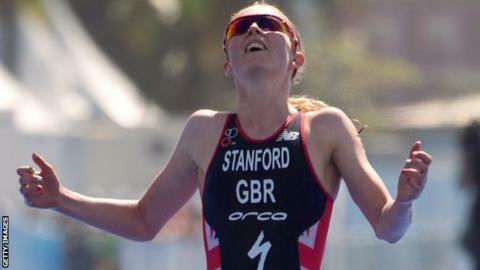 Britain's top female triathletes - Vicky Holland, Non Stanford and Helen Jenkins - will compete at the penultimate World Series event in Edmonton on Sunday. They should be in contention for honours as the top three in the World Series standings will all be absent. In the men's race, neither of GB's Brownlee brothers - Alistair and Jonny - is due to compete. Adam Bowden and Tom Bishop will lead the British challenge in Canada. The men's field is strong with the top three all taking part. Four-time world champion Javier Gomez Noya is top of the men's rankings ahead of fellow Spaniards Mario Mola and Fernando Alarza. Alistair Brownlee has had surgery on a persistent ankle injury and brother Jonny suffered a stress fracture in his left leg but he hopes to be back for the Grand Final in Chicago from 15-20 September. Holland and Stanford are looking step up their preparation for the Grand Final, where a podium finish would secure a place at the 2016 Rio Olympics. Stanford said: "This is a last chance to practice the small details before the Grand Final, which is obviously all important to me. "The focus on Sunday is to get everything right and hopefully get a good outcome at the end." Holland added: "We've been out here training for a few days and the course is pretty flat, so it should be really fast."